The first communications satellite— Echo I —was launched by the United States in 1960, transmitting telephone signals. In 1961 Relay began transmitting television signals, and in the same year Syncom established itself as the first geosynchronous satellite capable of transmitting signals to one particular section of the earth's surface continuously. About that time personal satellite dish earth stations were selling for approximately $35,000 per unit. Taylor Howard, an employee at Stanford University who was well-versed in the usefulness of satellites as relayers of data, is credited with designing the first satellite dish for personal use. Howard's dish, which was placed into operation on September 14, 1976, was made of aluminum mesh and was about 16 feet (5 meters) wide. By 1980,5,000 satellite dishes had been purchased for home use. In 1984 alone 500,000 were installed. Recent reports state that there are 3.7 million owners of home satellite dishes worldwide, and the number will continue to grow. A typical commercial satellite dish of the 1970s was made of heavy fiberglass, and the dish itself, at its smallest size, had a diameter of about ten feet (three meters). Since then, satellite dish design has shifted toward light-weight, aluminum mesh dishes (similar to Howard's homemade dish), some of which are inexpensive and small (three feet, or one meter, in diameter is typical), with many sections (petals) that can be easily assembled. England, Japan, and Germany, have led the way with direct broadcast TV, which sends signals directly to the viewer's dish, but the United States has yet to do so. This trend would yield smaller, more affordable satellite dishes and regulated satellite programming. 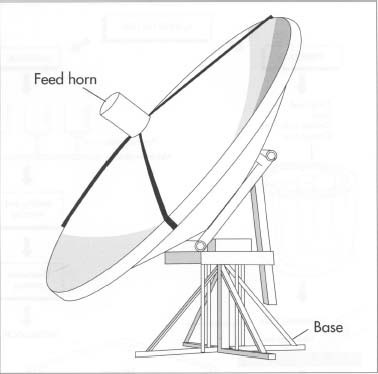 A parabolic reflector made of fiberglass or metal, usually aluminum, with a protruding steel feed horn and amplifier in its middle. A steel actuator that enables the dish to receive signals from more than one satellite. A metal (usually aluminum) shroud measuring about 6 to 18 inches (15 to 45 centimeters) in height. It is installed on the dish's circumference perpendicularly to reduce side interference. 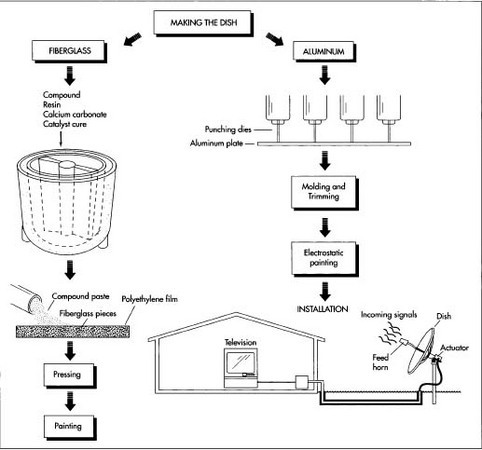 The manufacture of fiberglass dishes involves first preparing a compound paste that contains resin and calcium carbonate and pouring it onto a polyethylene film with fiberglass bits embedded in it. The material is then pressed into shape. In contrast, aluminum dishes are perforated with punching dies and molded into shape. Cables, most likely made from vinyl tubing and copper wiring. Although some current home satellite dishes are very small—only about 3 feet in diameter—manufacturers have begun to introduce even smaller dishes that have a diameter of only 18 inches and can fit on a window sill or a porch. be assembled in sections called petals, or all at once. An aluminum plate is perforated with a punching die, creating tiny holes. The size of these holes are contingent on the manufacturer's preference. Larger holes mean greater loss of the signal, so fairly small holes are selected. Another factor in the selection of hole size is the power of the broadcasting satellite. Newer, more powerful satellites require a hole size that is approximately half that required for older, less powerful satellites. The newly perforated aluminum plate is then heated, stretched over a mold, cooled, and trimmed. A paint powder coating for protection is then applied using an electrostatic charge, in which the paint is given an opposite electrical charge from the plate. The dish or petal is then heated to melt the powder and seal the paint on. The petals are usually sealed together with ribs in the factory. 6 An installation site reasonably clear of obstructions not more than 246 feet (75 meters) from the house is selected. Site selection is also contingent on local building codes and the possibility of microwave interference from radio and television towers in the vicinity. Once a site is selected, the base must be installed first. The base of most satellite dishes consists of a concrete foundation that extends below the frost line. A clayey soil is excellent, while sandy or rocky soil requires more concrete. A base tube filled with concrete is then set into the concrete foundation. Booth, Stephen A. "Signals from Space," Popular Mechanics. April, 1992, p. 60. Elrich, David. "Satellite TV: It's Worth a Closer Look," Home Mechanix. September, 1990, p. 78.